Gender discrimination is often seen from a human rights perspective; it is a violation of women’s basic human rights, as embedded in the Universal Declaration, the UN Charter and other such founding documents. Moreover, there is overwhelming evidence that restrictions and various forms of discrimination against women are also bad economics. They undermine the talent pool available to the private sector, they distort power relationships within the family and lead to inefficiencies in the use of resources. 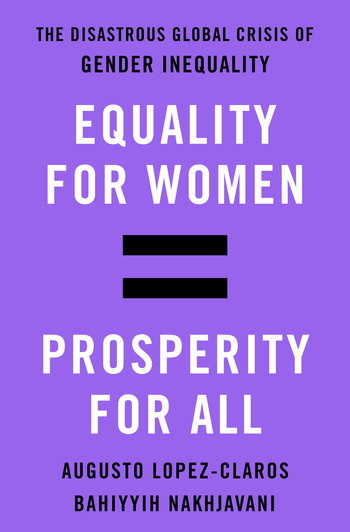 They contribute to create an environment in which women, de facto, are second class citizens, with fewer options than men, lower quality jobs, lower pay, often the victims of various forms of violence, literally from the cradle to the grave. They are also not fully politically empowered and have scant presence in the corridors of power, whether as finance ministers, central bank governors, prime ministers or on the boards of leading corporations. Why is gender inequality so pervasive? Where does it come from? Does it have cultural and religious roots? And what are the sorts of policies and values that will deliver a world in which being born a boy or a girl is no longer a measure of the likelihood of developing one’s human potential? Numbers tell us, quietly, a terrible story of inequality and neglect. AUGUSTO LOPEZ-CLAROS is currently a Senior Fellow at the School of Foreign Service, Georgetown University and was previously the Director of Global Indicators at the World Bank and Chief Economist at the World Economic Forum in Geneva. He has lectured in recent years at some of the world’s leading universities and think-tanks.